RICHLAND, Wash. — In the quest for renewable fuels, scientists are taking lessons from a humble bacterium that fills our oceans and covers moist surfaces the world over. While the organism captures light to make food in a process called photosynthesis, scientists have found that it simultaneously uses the energy from that captured light to produce hydrogen. While the nuances of how microbes draw upon sunlight, water, and elements like carbon and nitrogen to survive may seem detached and remote from modern life, such knowledge is central to our ability to meet the energy needs of our planet's growing population. "The ultimate goal here is to take energy from the sun, and water, and produce useable energy," said microbiologist Alex Beliaev, one of two scientists at the Department of Energy's Pacific Northwest National Laboratory who led the research. "The more we know about the pathways involved in this process, the more likely we will be able to find a facile and economic way to produce renewable energy. The organisms that produce clean energy naturally provide a blueprint of sorts for how we might do this." 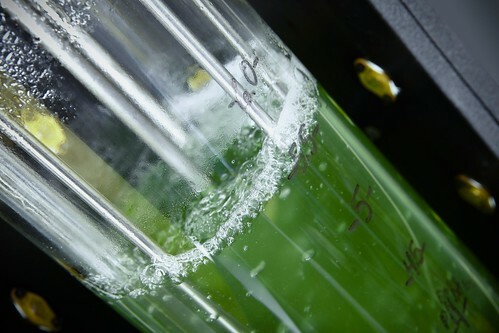 The latest finding, published in Scientific Reports, concerns a cyanobacterium known as Cyanothece 51142, a type of bacteria also called blue-green algae that produces hydrogen — a resource that is one focus of the worldwide push toward renewable energy. PNNL scientists found that the organism taps into an unexpected source of energy to create hydrogen. Researchers have known that 51142 makes hydrogen by drawing upon sugars that it has stored during growth. In this study, PNNL researchers found that the organism also draws on a second source of energy, using sunlight and water directly to make hydrogen. Organisms like cyanobacteria made life on the planet possible by producing the oxygen for our atmosphere 2.3 billion years ago. They also convert the abundant nitrogen in our atmosphere to a form that is essential for all plant life on the planet. "If we want to understand life on Earth, and how to improve it, this is a great place to start," said first author Hans Bernstein, a Linus Pauling distinguished postdoctoral fellow at PNNL. Bernstein and Beliaev are co-authors on the paper. Many of these organisms are equipped with an enzyme called nitrogenase to convert inert atmospheric nitrogen to more usable forms for plants and other organisms. For a long time, scientists have known that nitrogenase produces small quantities of molecular hydrogen as a byproduct. When nitrogen is not available, the organism produces hydrogen. It's this attribute of the enzyme that scientists like Bernstein and Beliaev focus on. The team set up Cyanothece 51142 in a bioreactor, limited the supply of nitrogen, and kept the lights on 24 hours a day for several weeks. The team used an array of high-tech equipment to yield sophisticated minute-by-minute profiles of the organism as it converted light energy to hydrogen. Scientists conducted many of their analyses using capabilities at EMSL, the Environmental Molecular Sciences Laboratory, a DOE user facility at PNNL, to "interrogate" the genes and proteins of the organism as they changed while the reactions occurred. In scientific parlance, the team conducted a "multi-omics experiment," studying the genomics, transcriptomics and proteomics of the organism's activity, as well as its reaction kinetics. The scientists scrutinized 5,303 genes and 1,360 proteins at eight separate times over the course of 48 hours as the bacteria, with limited nitrogen supply, switched on the activity of the nitrogenase protein. Scientists found that in addition to drawing upon its previously stored energy, the organism captures light and uses that energy to split water to create hydrogen in real time. As one component of the organism is creating energy by collecting light energy, another part is using that energy simultaneously to create hydrogen. Scientists know that the organism is a robust producer of hydrogen, creating the resource at a rate higher than other known natural systems. "This organism can make lots of hydrogen, very fast; it's a viable catalyst for hydrogen production," said Bernstein. "The enzyme that makes the hydrogen needs a huge amount of energy. The real question is, what funds the energy budget for this important enzyme and then, how can we design and control it to create renewable fuels and to advance biotechnology?" In a paper published in 2012 in mBio, Beliaev and colleagues raised questions about how the microbe drew upon the energy required to produce hydrogen. In the new paper, the molecular signals the team studied show that photosynthesis and the hydrogen production by nitrogenase happen hand in hand in a coordinated manner. The team includes 11 researchers from PNNL. 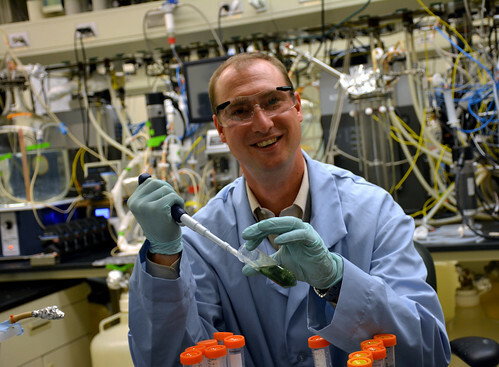 Beliaev began the project seven years ago as part of hydrogen production research related to biofuels, and Bernstein picked it up when he joined PNNL two years ago. "Our primary goal is to understand the fundamental processes that occur in nature, so that we can learn to design and control complex biological systems to sustain healthy people on a healthy planet," added Bernstein. The work was funded by the Department of Energy Office of Science (Biological and Environmental Research) and by PNNL's Laboratory Directed Research and Development Program, which funds the Linus Pauling Distinguished Postdoctoral Fellowship Program. Reference: Hans C. Bernstein, Moiz A. Charania, Ryan S. McClure, Natalie C. Sadler, Matthew R. Melnicki, Eric A. Hill, Lye Meng Markillie, Carrie D. Nicora, Aaron T. Wright, Margaret F. Romine and Alexander S. Beliaev, Multi-omic dynamics associate oxygenic photosynthesis with nitrogenase-mediated H2 production in Cyanothece sp. ATCC 51142, Scientific Reports, Nov. 3, 2015, DOI: 10.1038/srep16004.